This Case History is of a cell washer designed and built in 1998 for in-process washing of gears. It use dual zones in a single chamber. In the lower zone (below left) immersion washing with agitation/turbulation is used combined with SurfaceSweep oil removal. Cutting oil is thoroughly washed from the gears and routed out of the processing chamber into an offset quiet tank. There the oil separates and is automatically removed using a stainless steel oleophilic belt skimmers. In the upper zone (below right) platform oscillation is uses combined with compressed air blow-off to dry the gears before removal from the washer. The system is fully automatic. An operator or robot simply loads and initiates the cycle by energizing a start button. Although compact the system can handle a workload up to 24″L x 18″W x 8″H and 150 pounds. A special oscillating cylinder reciprocates in both upper zone and a lower zones transporting the workload into the washing zone and sequencing it into the air blow-off zone. When the cycle is complete the cover opens and platform rises ready for unloading. 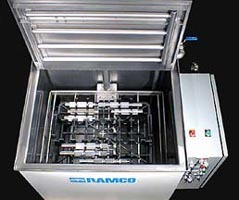 RAMCO cellular washers provide highly effective cleaning for a wide variety of components. 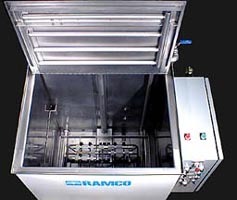 Another cell washer is shown below. 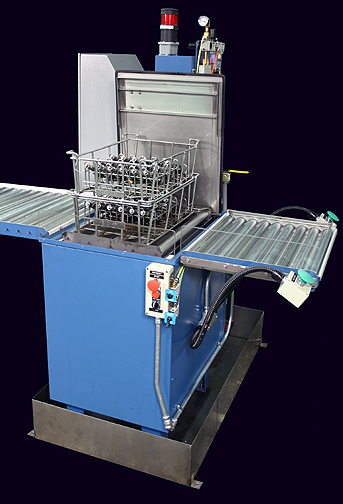 This system was built in 2003 for a major automotive manufacturing facility to provide a final wash/RP rinse for valve components using transmission fluid for the cleaning agent. The system is built in accordance with factory specifications. It processes two baskets of components (double stacked) and rolled onto a process elevator via roller conveyors. The operator loads from the side using dual palm buttons to initiate the process. The work is automatically washed using Turbo/Filter dynamic flow agitation and solution turbulation. The cover automatically opens and closes in sequence with the elevator. Other features include automatic solution make-up, level controls with fault warning stack light and a containment pan. When the process is finished the work automatically comes up to the original loading position and the cover opens. The operator easily pushes the load to the left onto a descending conveyor section that holds up to eight baskets. 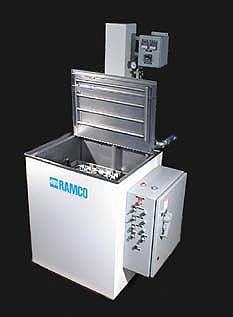 Would you like to see more Ramco Cellular Washers?